Facts about Red Stemmed Parrots Feather plant. "Scientific name for Red Stemmed Parrots Feather plant is Myriophyllum brasiliensis". Red Stemmed Parrot’s Feather is a great oxygenating plant that is conspicuous because of its red stems. These stems when paired with its bright green feathery leaves, creates an attractive set up. The scientific name is derived from Latin. “Myrio” is translated to mean “too many to count” while “phylum” on the other hand means “leaf”. Although it is spread all over the world, the origin of this plant is South America especially in areas around Brazil. The climate of the South American continent makes the Red Stemmed Parrots Feather plant to grow well even with little human intervention. The Red Stemmed Parrots Feather plantr is usually found around bog gardens and smaller ponds. It is also one of the plants that have shown a high rate of adaptation. As such, it is grown at the edge of ponds as a marginal in boggy and shallow conditions and stems can be up to 5 ft (1.52 meters) long. Being an oxygenator, it can also be slightly submerged up to 12 inches or (30 cm) deeper in some areas. Red Stemmed Parrots Feather plant is planted in small buckets filled with aquatic soil. Pea gravel is then used as a covering to stop the medium used in the planting from clouding the water. Some of the leaves grow above the water surface while others grow under the water. Those that grow under the water surface tend to be longer and less stiff that those appearing above the water. The underwater leaves form an excellent habitat for various aquatic lives. From June up until August, the Red Stemmed Parrots Feather plant goes through a flowering period where tiny yellow flowers are borne. The flowers emerge on the leaf axils. 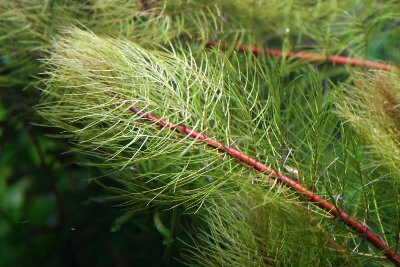 The Red Stemmed Parrots Feather plant is usually cut below the water level in the late autumn making it go through winter without frosting. It grows very fast and its propagation is done through cuttings.